In the past few months I’ve discovered a weird new kind of tea. At first I thought the people drinking it were just freaks. I watched some people scooping out spoonfuls of what appeared to be jam, schlopping it into mugs, adding hot water, stirring it up real good, and drinking it. I was shocked by this behavior. Clearly, jam is meant for bread and crescent rolls and such, not hot water. These people explained to me, however, that the stuff in the jar was not jam. It was, in fact, tea. This kind of tea comes from Korea, I understand. The most popular flavor is “citron tea.” It’s made with honey. I dunno… looks like jam to me. So I tried this so-called “tea” and I found it really good! It’s sweet, like the “fruit tea” (I think it’s just Kool-aid) you get in teahouses. When you get to the bottom of your cup, there’s always these grapefruit shreds. They’re pretty tasty too. The scientist in me has this urge to find out just how different this “tea” is from jam. That would probably involve spreading it on a piece of bread. Either that or adding some real jam to hot water and drinking it. But I don’t think I want to do that… My passion for science has its limits. Good stuff! It’s also excellent for sore throats in the winter. Now if I could just find the right liquor to mix it with…. The British in me would find this very convenient if suddenly my jam and my tea could be the same thing. Is there a marmalade flavor tea? If so, I take it with two sugars and a splash of milk. Ugh doom how could you think of doing that! Anyway, nice idea for a Christmas pressie for all such once-were-British people who could drink use it to wash down scones without jam. 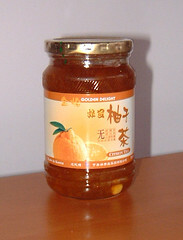 I recently tried a Korean lemon-type Jam Tea for a sore throat/cold and it worked wonders. Would this be the same concept as adding honey to a boiling cup of water? Or adding milk to a quick oatmeal packet in a bowl? As long as it assimilates into liquid, tastes good, I don’t mind drinking a concoction made from jam mixed with water. Cool product. I have tried mixing ordinary jam and tea and it was suprisingly tasty, it had a sweet and fruity taste. goes great with white rum or vodka and probably anything alcohol based. Korean citron tea is yummy and good for sore throats and colds. However, the commercial stuff is loaded with refined white sugar. I prefer homemade honey lemon tea or honey ginger tea. Korean citron tea is yummy and good for sore throats and colds. However, the commercial stuff is loaded with refined white sugar or high fructose corn syrup. Ditto for ginseng tea. I prefer homemade honey lemon tea or honey ginger tea. my parents got me some of this tea for Christmas (I just googled it and that’s how I found your page) I am enjoying my first cup right now. I had to look it up because the stuff kind of weirded me out. Being in Korea, I see the stuff everywhere. I love it. Since the hot water dispensors here are never hot enough for black tea, it gives me something tasty and hot to drink when I don’t have a kettle. The ‘jam-tea’ comes in many different flavors: Citron (which is a fruit called citron, not grapefruit, and the leftover fruit tastes great too! ), Quince, Jujub, Ginger, and a bunch of others I can’t remember. It’s basically jam without the gelatin. Easy to make, then you can cut down on the sweetness! Adding jam to tea is very popular in Russia… they call it kompot (from the French, we get the English “compote” from the French, too). Kompot can be any fruit but I usually saw blackberry, and it’s used in place of sugar or honey to sweeten the tea. Russians really mangle tea, too… They get an itty bitty teapot, what we would consider a “one cup” teapot, and fill it halfway up with loose tea. Then they add water. They let this sit and become “tea concentrate” (and VERY BITTER). They then poor a little concentrate into a teacup and add hot water and kompot. The worst part is that they leave the tea leaves in the teapot for days and days and days, sometimes adding a fresh spoonful of loose tea to make it last longer. I have a jar of this in my fridge. I am a Chinese living in Canada currtently. I miss China so much so I am trying to be closer to everything about China as much as I can, that is why I found this blog. My point is it is quite interesting that we are drinking the same Korean tea when none of us is Korean and in Korea. http://www.tradewindsfruit.com/yuzu.htm The fruit is a yuzu. You can make your own “tea”, by adding the sweetener of your choice. Yuzu has many other uses as well, culinary as well as beauty, Google it. As a saleman exportong to citron tea to all over the world it is not a weird thing that so many people consider it as a jam. Some people say you eat jam like a tea after stirring well with hot water or cold water. But, it really affetcs to cure sore throat and fatigue. Citron contains 3 times vitmamin C than lemon so for a long time we loved it and enjoyed it in winter season in Korea. Also, to enjoy it in summer season we launched portion type citron tea like a small plastic jar, it melts well with cold water. I tried this tea at a Thai restaurant and loved it….does anyone know where I can buy a jar?…either on line or somewhere in Canada. My mum found out about this citron tea a while ago in a Korean convenience store. You know those stores with the suffix -mart?? There are heaps in the city, eg Central Mart, Charm Mart, Family Mart, etc. They sell jars of yuja-cha (the Korean name for this drink). I would love to make this stuff. I have had it and want to make some for the winter. Is there a recipe? I see in previous posts that it’s easy to make. Please — I’d love a recipe. Google ‘Korean citron tea recipe’ and you will find a couple more. I don’t think you can buy citron fruit in Australia, but I’m going to try it with lemons and limes. Cheers. I’ve tried Citron and Jujube; Citron taste much better and has more health benefits. On hot summer days I dissolve it (by stirring) on cold water and gives me a refreshing drink. On cold winter nights I pour hot water on 4 teaspoon of this Yuzu to warm me up. A word of caution though for dieters and diabetic before indulging in this drink: it is packed with calories due its high content of fructose and glucose. A diabetic’s sugar level would skyrocket for sure. Only a small percentage of honey is used; instead a lot of refined sugar or high fructose corn syrup (as one poster said) is added as ingredients. I want to try next time the elusive Korean Ginseng Honey Tea (also same type as Yuzu) which are so hard to find in Asian markets. Perhaps a Korean Supermarket carries this. Now this one would a real energy drink. Cheers! I recently had my first cup of Citron tea and fell in love. I searched high and low online and was not able to find it for sale, at least not the specific brand I had tried. On a recent trip to San Jose my girlfriend found a different brand and it was equally as good. It sales for $4.99 a jar and she found it in a Korean Market. I have to say we called every asian market in the greater San Francisco bay area where we live and most of them had never heard of this product. When she found it for me, we bought six jars to make sure we have enough to last until our next trip south. I was googling for an online resource when I found this post. I have a Meyer lemon tree in the back yard and like to squeeze a half of a fresh lemon and add one packet of splenda to mine. Seems to cut the bitterness just a bit. As for mixing with an alcohol, my italian grandmother makes a homemade liquor called LEMONCHELLA which is amazing and mixes quite well. Google a recipe, its easy and inexpensive to make. ENJOY!!! I know this thread is old but I thought I’d chime in. This is the best herbal tea ever. I mean ever! I’ve tried numerous brands of citron tea, however, in my opinion the best by far is a USDA and EU organic version. I came across it on a web search a few months ago. Tastes so much better and you don’t have to worry about what’s inside. Yazu+ by General Mings. If you like citron tea you’ll freak on this stuff. The only thing that is tough is they ship out of Asia and it’s crazy expensive. If they sold it in the stores in Canada I am sure they would have difficulty keeping it in stock especially during the winter months. I am proud to say that I decided to try normal jam (marmelade… I read the russian wrong and forgot that Jam in russian means Marmelade) with hot water. It tasted too sweet because I may have added too much marmelade but, on second try, was no different from any good quality tea!